Happy New Year! I thought I’d start the new year right with a light salad (just don’t eat too many of those warm goat cheese rounds on toasted baguette, ok?!) Wishing you and your family a fun-filled, healthy and prosperous New Year! It’s a brand new year and I’ve just now started my winter garden, which includes celery, salad greens and herbs such as sweet basil, parsley, cilantro, Thai basil, chives and thyme. Some gardeners will say I’m late, others will say I’m too early, but all I know that this little snippet of time between Christmas and New Years is the perfect schedule for my household. My mother-in-law, an avid quilter, and my father-in-law, a skilled woodworker, are both in town. Neither of which has anything to do with MY garden, except for the fact that the mere presence of them forces my husband to work less at the computer and be on his best behavior as a model parent. “Oh, dear husband, since you’re not programming code at your desk this week, how about helping plant our family garden that provides nourishment to your children?” Of course, I have to wait for the perfect moment to bring this subject up, both in-laws have to be present and we must be at the dinner table enjoying a lovely family moment. How could he say no? He looked at me, cocked his head and smiled. 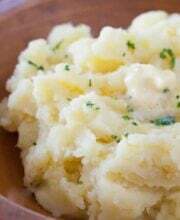 This recipe is from a brand new cookbook called In a Cheesemaker’s Kitchen written by the founder of Vermont Butter and Cheese Company, Allison Hooper. 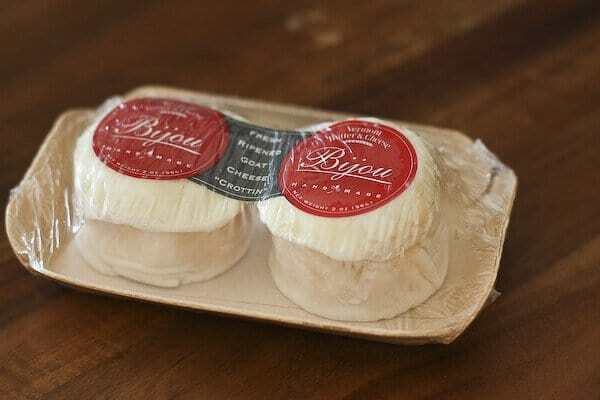 The company is most known for their goat cheese, but also make cultured butter and cow’s milk products like Quark, Fromage Blanc and Mascarpone. I’m in love with their Quark cheese, which is a German-style fresh cheese. 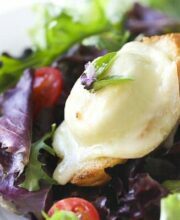 For this salad, I’ve used their Bijou cheese, which is goat cheese that is molded and into small, adorable rounds. The cheese is aged for one week, and the longer it is aged, the shaper and more robust the flavor becomes. I’ve cut each button-shaped round into three thick slices to top on a baguette slice and after a couple of minutes under the broiler, the cheese melts and oozes all over the bread. Try this recipe with any type of cheese you like, even a spoonful of crumbled gorgonzola on each bread slice. 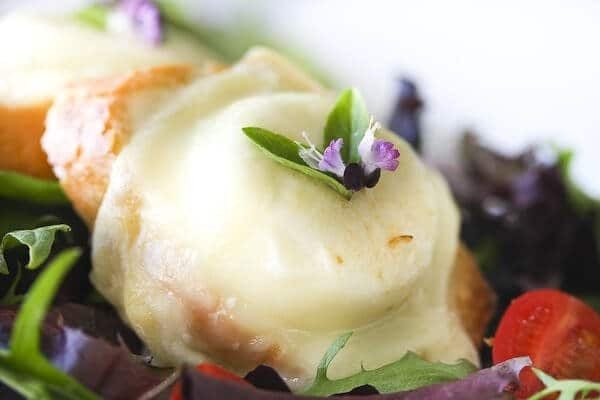 The beautiful purple flower on the cheese is actually the little flower bud from Thai basil from my garden. Regular sweet italian basil will have light green buds and white flowers. To make the dressing, whisk together the basil, mustard, vinegar and olive oil. Season with salt and pepper. Brush each baguette slice with olive oil. Place a goat cheese round or slice on each baguette. Place under broiler until the cheese is soft and a little runny, about 2-3 minutes. Toss together the salad greens with the tomatoes. Drizzle some of the basil vinaigrette (you may not use all of the vinaigrette) and toss to coat. 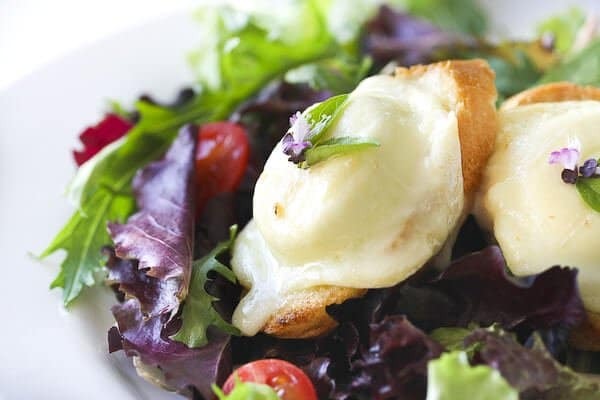 Serve the salad with 2 pieces of the warm toasted cheese baguette per person. I just made this tonight. It was very boring and plain. Tasted like a plain salad with vinegarette and a hunk of bread with goat cheese on the side.not very ceative at all. 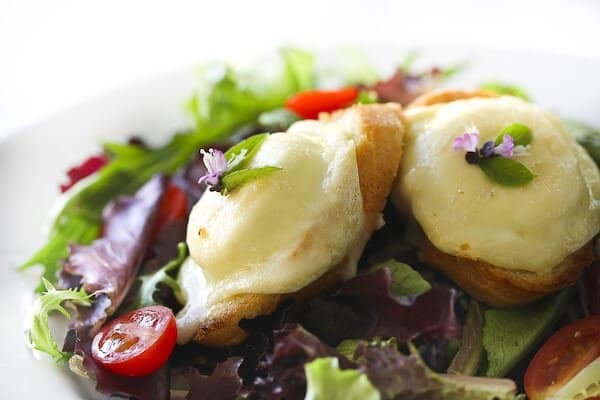 There are much better recipes for a warm goat cheese salad out there. I enjoy melted goat cheese on pizza. It had never occured to me to warm goats cheese. You are an inspiration! Funny post and a great reminder that I might want to start working on those raised beds I’ve been dreaming of. Maybe when things warm up just a touch more out here in LA I’ll get going on growing myself a garden so I can make this salad! In the meantime, I’ll turn to my local farmer for the ingredients and save my husband favors! I am an avid gardener and I love Thai basil; this year I also grew red basil that had the most beautiful purplish leaves and shocking magenta flowers. My Thai basil was the one that really flourished, though, and I can’t wait to plant some again this year. The arugula there looks very tempting, too, and it’s one of the absolute easiest salad greens to grow. I am still jealous my aunt got a copy of your cookbook from Santa, but I’m so happy you give recipes like this on your blog! i’m a HUGE goat cheese fanatic, homemade is the best! i have some leftover and was JUST thinking of a nice, green salad to top it upon. happy new year, jaden! I made this last night for dinner as our starter salad (my husband and I cooked dinner for my in-laws), and everyone loved it. The dressing was a big hit! And, of course, who can turn down goat cheese toasted on french bread? Not us! Goat cheese is one of my all-time favorite foods! Your salad looks amazing … as does the vinaigrette. Happy New Year! PS: While you’re planting your garden, I’m digging out from the second mega snow storm of the year! It was an great year 2009 for you with the cookbook and Tv, I wish you the best for 2010 ( you’re own Tv Show perhaps?). 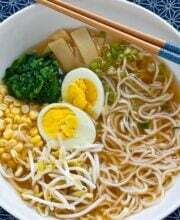 I’m Happy that my friend the Zenchef told me about you. I’m soo with you on this one, warm goat cheese salads are my favorites! Happy 2010, Jaden! Best wishes to you and your lovely family: good health and of course good food 🙂 I love your salad and the photos. I could a ton of these goat cheese toasts! Happy New Year!!! Hope you had a wonderful holiday with the inlaws. 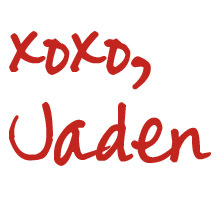 Happy new year to you and your beautiful family, Jaden! You and your hubby are adorable 😉 Love the salad. It’s the right way to ring in the new year with something light … after all that feasting! Cheers! First of all, Happy New Year!!! Love the post. Love the pics. Is that a basil flower? Will be planting soon. Just used my last basil to make bolognese sauce. As soon as the temp get more “Florida like” will be planting basil, thai basil, lime basil, thyme and lettuce. My oregano, marjoram, rosemary, mint and dill seem to just keep on keepin’ on regardless of the weather (Don’t freeze!!!) Looking foreward to good posts and good food in the coming year. Heres to a Steamy 2010! Salad looks yummy! I love the photo of cheese with the flower on top! Is that a flower? Anyway it is beautiful! I’ve received your cookbook for Christmas… It’s a real pleasure to have it, your pictures are beautiful! Thank you Jaden, and congratulations for all the work you did! Mmmmm…Yum! Gorgeous photos, as always. This is definitely in my future. Happy, happy New Year to you and your family, Jaden! It’s jaw-dropping Jaden! The photos just blow me away. I love the simplicity and wonderful flavours in this! Wishing you all the best in this new year =D. 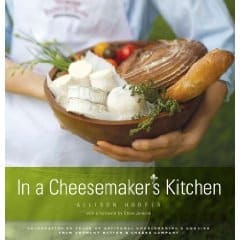 Looks terrific- I LOVE Vermont Butter and Cheese products; it’s so nice to know they have a cookbook! Thanks for sharing this yummy salad Jaden. Enjoy your winter garden and I hope you have a great 2010! Happy New Year to you and your family, Jaden! Oh, this salad looks wonderful (good for husband?) Of course anything with cheese on it for me, mmm…. I need to plant my garden too. Do you use a Earthbox for your greens? Happy New Year Jaden! I’ve only recently started eating goat cheese and love it, so light and fluffy. Great to hear you’re starting veggie garden. This looks like a great salad with crunch from the baguettes. Nice combination of tastes. Thanks for sharing the recipe and details. Always helps me out. Oh, I miss my garden! I still have some rosemary, sage, and mint that have survived the cold weather. My basil plants have long since shriveled up and turned black. I bookmarked this so I can be sure to try it when the weather warms back up! I’ll forgo the salad and eat just the goat cheese and baguette. Your photos make the food look so delicious. Happy New Year, Jaden. I hope 2010 is all you ever dreamed of and more! P.S. The salad is lovely. I wish I could plant basil already! Too cold here. This salad looks so yummy! Happy New Year to you! Your garden sounds lovely – have some fresh basil for me, please. I would agree with Amy that a salad like this makes me want to eat more salad. I’m also excited about the Cheesemaker’s Kitchen – I think it will go on my wish list for Valentine’s Day. 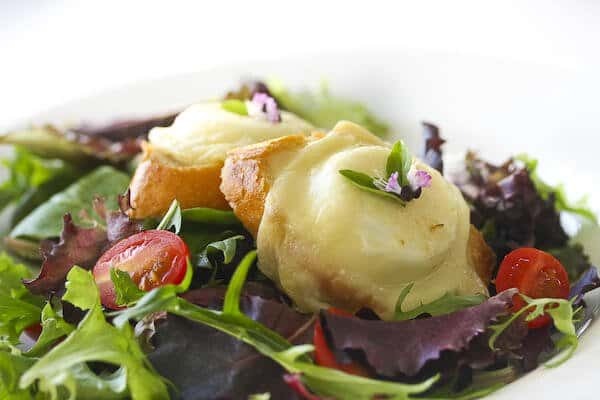 I really appreciate that this recipe mixes just a bit of tasty cheese with the greens, it’s a great example of how to eat lighter without sacrificing those foods we all love most. The perfect lovely lunch for New Years’ morning. What pretty colours and textures! I could definitely eat more salad if they were all like this one. Love the color – makes me yearn for spring already.